Berry Dakara: My Birthday Wishlist! 1. A Mini Spa Day - I don't know if it's all the walking we've had to do during this family vacation in the UK, but all I want is to relax. In my mind, the perfect present would be a gift card to a spa for a facial, full body massage, reflexology, steam bath or sauna session, and finishing off with a lovely cup of tea! I can already feel the stress leaving through my feet. Everyone breathe deeply and say, "aaaaahhhhhh." 2. Me Time - Normally I want to spend my birthday with lots of family and friends around. I like the attention I get on that day and relish answering birthday calls and messages. But I feel like I'm in a reflective space right now. I'm not where I thought I would be at this point in my life, and in some ways, I feel like I'm losing my essence and I need to recapture ME. In fact, if I could combine the first item with a hotel stay, it would be the absolute, best, perfectest way to spend my birthday! I may even be like some people who turn off their phones and go dark on social media. Alas, this is simply a wishlist - wish, being the active word. We're back to Atlanta this weekend and there are 3 or 4 events I'm attending, soooooo alone time and spa day will have to come at a later time. 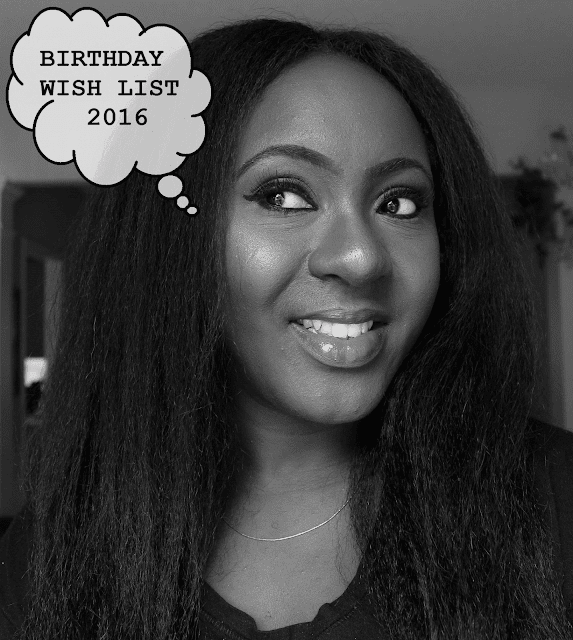 What is (or was) on your birthday wishlist this year? Thinking back, I've never had a wish list. Hello and Happy Birthday to you and your Grandpa. Here's wishing you a memorable day filled with love and laughter! LOL! Your list is very expensive! My birthday is still far away but I like the idea of a spa trip. Though, honestly I'd love a vacation outside the country perhaps and ooo a new pair of high heels, a laptop, lol the list is endless. An iphone 6s 64GB space grey but i didn't get it and yesterday was my birthday. Awwww, Happy Belated Birthday! Sorry you didn't get what you wanted. Maybe you can save up for it, or get it for Christmas? Now emailing this to Cakes, re Spa. My birthday is still far away. Too early to think of a wishlist. But Reflecting is always good. Have a good birthday Berry! The spa is happening this week!!! Yay yay! If only the material things we wish for could bring us true happiness....but anyways I don't mind a new car. Lol. BUAHAHAHAHAHAHAHAHAHAHA. I cannot even with you right now. Well I never really have much of a wish list and I can understand what you mean about wanting to have some me time on the day. That is what I did myself and most of my friends were surprised I did not have a party. I just went to the spa, had a chilled dinner with hubby, and that was it. I could use a spa day right now! I need a new kitchen, a new kitchen and a new kitchen. That's what I want for my birthday. LOL! Please as you're cooking, send them my way! Thanks!!! Ooh a car right now sounds great to me! What kind are you eyeing?